​The Solid Edge ST10 portfolio of products from Siemens brings every aspect of your product development to the next level. It gives you the very latest in next generation design technologies. Fully integrated flow analysis. The newest tools for 3D printing. More options for creating technical publications. Perfect control of design data at any scale. And a brand new way to collaborate on the cloud. ​The future of 3D product design software is available now with Solid Edge generative modeling, additive manufacturing and reverse engineering capabilities. Enabled by unique Siemens convergent modeling technology, these capabilities work alongside traditional Solid Edge editing tools to seamlessly integrate existing products into your development process. ​Supplementing powerful design tools with topology optimization, generative design speeds creation of lighter components perfectly suited for immediate manufacture via today’s additive processes. Or use Solid Edge to further refine the shape for more traditional manufacturing. ​Solid Edge additive manufacturing solutions enable you to create world class products using the latest 3D printing and additive manufacturing techniques. 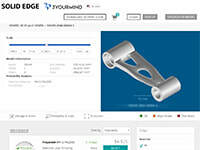 ​Many teams design products utilizing components imported from other CAD systems. With the rapid growth of high-resolution 3D scanners, even legacy parts designed on the drawing board can be digitally represented and modified to suit contemporary designs without complete reconstruction. Solid Edge delivers tools which support reverse engineering workflows. ​Solid Edge seamlessly combines traditional “b-rep” solid models with triangular mesh models without time-consuming and error-prone conversions. Convergent Modeling by Siemens allows for traditional b-rep operations on digitally scanned 3D data and models born out of generative design, reducing rework while supporting modern additive manufacturing processes for complex shapes. ​Solid Edge makes creating and editing 3D product designs faster and easier through our unique synchronous technology - combining the speed and simplicity of direct modeling with the flexibility and control of parametric design.